There's a science to choosing the right carton for a particular product. And Carolina Biological Supply can't afford to leave anything to chance when it comes to shipping delicate instruments and laboratory equipment to classrooms nationwide. To make sure it's packaging those goods with scientific precision, the company turned to a new packaging solution from Box on Demand. Carolina Biological supplies schools of all levels (elementary to college) with a wide range of scientific products—everything from live fish and butterflies to chemicals, laboratory beakers, and instruments. "If you can imagine using it in your science class, that is what we sell," says Jeff Humble, the supplier's logistics engineering manager. The company uses four pack lines for its orders. Three of the lines handle the live products, specimens for dissection, kits for experiments, and the like. The Box on Demand system is located on the fourth line, which is devoted to instruments, equipment, and supplies. This line handles the majority of products shipped and the most diverse array of stock-keeping units (SKUs). "We see two principal benefits," says Humble. "One is the cost. We are shipping less air now and have reduced our dimensional weight. The other is it supports our customers' efforts to be 'green.' We use less dunnage and corrugated material, and now we ship in the smallest carton we can use without damage to the product." The Box on Demand system automatically measures the items to pack and then produces the optimally sized box within about 10 seconds. Sheets of continuous corrugated are fed into the Box on Demand machine. The system then cuts and scores the carton to the exact dimensions specified. 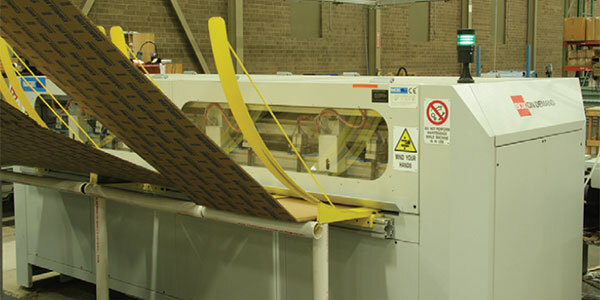 At that point, the machine discharges the flat carton, which is fed through a gluer that folds and seals the tabs to create the box. The worker tapes the carton bottom, places the items inside, adds some protective material, and seals the top. A label is printed and added before the carton is conveyed to shipping. The system makes about 450 boxes per day.